"Tinnitus" stems from the Latin term "tinnire" which means "to ring" and may be defined as "a sound perceived for more than five minutes at a time, in the absence of any external acoustical or electrical stimulation of the ear and not occurring immediately after exposure to loud noise." The incidence of tinnitus is found to be around 15% and is usually associated with hearing loss. Although various pathologies have been explained, it is thought to be an auditory perception due to spontaneous activity, arising from an altered state of excitation or inhibition within the auditory system. The first account of treatment of tinnitus goes all the way back to the Egyptians and continued throughout the middle ages and with the dawn of the Renaissance surgery is introduced into treatment of tinnitus. However to this day, no precise treatment has been identified. The present study was planned to have an insight into the characteristics of hearing loss with respect to tinnitus and the efficacy of various modalities of treatment of tinnitus. A prospective study was carried over a period of 2 years from November 2009-October 2011 in the department of otolaryngology, head and neck surgery, in our institution, after obtaining ethical clearance from the institutional ethical committee. Convenient sampling was adopted for recruiting the participants. Informed consent was obtained from all participants prior to conduction of the study. The participants included 78 individuals based on the inclusion criteria such as age above 18 years; subjective tinnitus associated with sensorineural hearing loss and presence of tinnitus for more than 3 months. Patients with objective tinnitus, patients with tinnitus due to causes other than inner ear pathology and acoustic neuroma were excluded from the study. Each participant underwent a detailed history and clinical examination followed by a pure tone audiogram, obtained using calibrated Grason Stadler Inc 61 (GSI 61) clinical audiometer in a sound-treated room. Tinnitus handicap inventory (THI) score was administered on all participants, followed by an objective evaluation of tinnitus pitch and loudness matching using the ascending descending combined procedure. Following the assessment, participants were divided into three groups for management. The first group received gingko biloba 40 mg thrice daily, the second group received gabapentin 100 mg thrice daily and the third group underwent tinnitus retraining therapy (TRT). The goal of training was to habituate the participant to tinnitus. Initially, the participant was allowed to select the noise, music, or environmental sound of their choice. The participant was then asked to adjust the volume of sound to a comfortable level with intervals of tinnitus in the stimulus. Treatment protocol was administered for a period of 6 weeks. Following management, tinnitus handicap inventory was read ministered. The scores of pre- and post treatment were compared and evaluated for both groups. The collected data were entered in Microsoft excel and statistical analysis was done using SPSS version 11.5. Paired t-test was done and P < 0.05 was taken as statistically significant. A total of 78 individuals (39 males and 39 females) participated in the study within the age range of 18-82 years. 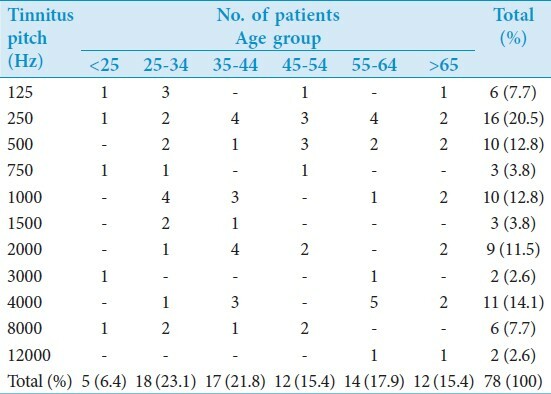 Most participants were between 25 and 44 years, with least participation below 25 years [Table 1]. A descriptive analysis of pitch match data revealed that in majority 20.51% (16) of patients, tinnitus frequency had matches at 250 Hz, followed by 14.1% (11) at 4000 Hz. Tinnitus match was minimal at midoctaves 750 Hz, 1500 Hz, and 3000 Hz, and least at 12000 Hz [Table 1]. Among the study population, 35.9% (28) had a THI score ranging from 38 to 56 (moderate tinnitus), 32.1% (25) with a score ranging from 18 to 36 (mild tinnitus) with only a small number of participants (5.2%; 4 cases) having scores ranging between 78 and 100 (catastrophic tinnitus) [Table 2]. A comparison between tinnitus pitch matching frequency and THI scores for the participants in both the ears failed to demonstrate significant correlation (r = −0.019, P = 0.87). 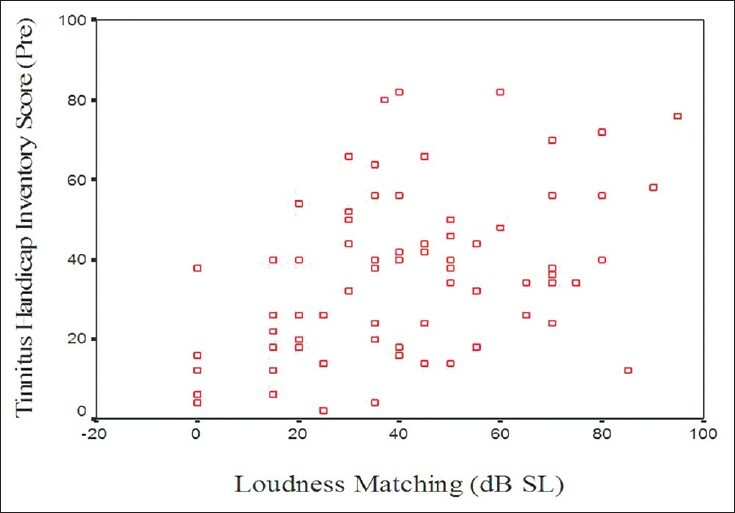 However, a significant correlation (r = 0.383, P = 0.001) was observed between tinnitus loudness matching intensity and THI scores in both the ears as seen in [Figure 1]. The study also attempted to find a relationship between the pure tone thresholds and tinnitus loudness matching intensity. In participants with unilateral tinnitus, the tinnitus ear was considered the test ear, and in participants with bilateral tinnitus, the ear with louder tinnitus was considered as the test ear. On analyzing the data, it was found that 75.4% of participants showed loudness matches near the threshold of frequency at which they had maximum hearing loss. On statistical analysis, a positive correlation was observed at the tinnitus loudness matches obtained at the frequency of maximum hearing threshold (r = 0.687, P = 0.001). This indicates that as threshold of hearing increased, the perception of tinnitus loudness also increased [Figure 2]. Comparing THI scores before and after 6 weeks of management using gingko biloba, gabapentin, and TRT using paired t-test revealed a significant difference (P < 0.001) between pre- and post management scores after treatment with gingko biloba and TRT but not with gabapentin (P = 0.051) [Table 3]. Tinnitus, which is thought to be a phantom auditory perception, is a phenomenon that has been described centuries ago. In ancient China, it had been regarded as sensitivity to the divine; however, ancient Egyptians and Mesopotamians believed that tinnitus occurred in a bewitched ear. It was also reported that Charles Darwin who suffered from tinnitus kept records of its daily amplitude and frequency. However, to this day the pathophysiology has not been explained and no precise treatment has been found. 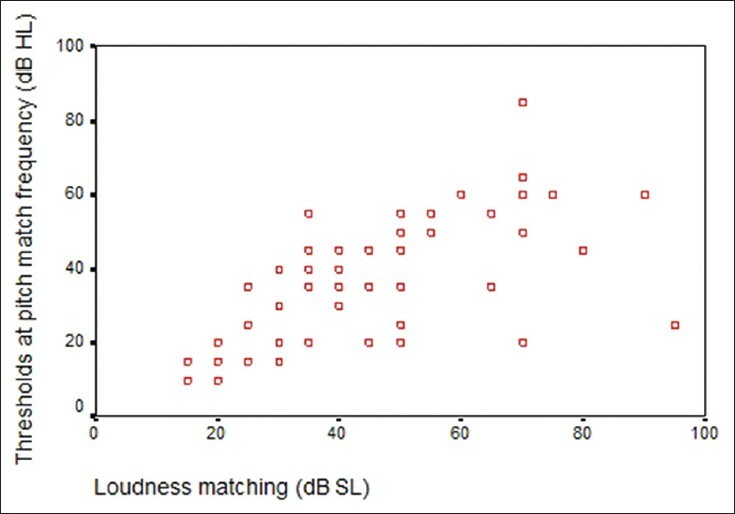 The current study attempted to explore relationship between the pure tone thresholds and tinnitus loudness matching intensity and found a positive correlation between tinnitus loudness matches obtained at the frequency of maximum hearing threshold indicating that as threshold of hearing increases, the perception of tinnitus loudness increases. Tinnitus pitch matches obtained did not follow any specific pattern of matches. However, it was found that 71.8% of the participants had tinnitus matches at or below 2000 Hz. Results of this study are in consonance with that of Pan et al.,  who found that patients with a tone like tinnitus reported a higher pitch compared to those with a noise like tinnitus, who have a pitch less than 2000 Hz. They also concluded from their study that there was no relationship between tinnitus pitch match either across individuals or with audiogram variables. In the current study, there was no correlation between pitch match frequency and THI scores, but a significant correlation was observed between tinnitus loudness matching and the THI scores. Searchfield et al.,  studied the impact of hearing loss on tinnitus severity index, and although the study did not report statistically significant correlation with any of the variables of the audiogram for the tinnitus severity index, some aspects of the pure tone audiometry, especially the elevated low frequency thresholds correlated with greater tinnitus handicap. Steinmetz et al.,  studied the interference of tinnitus on the quality of life of individuals in a noise exposed working condition using a Brazilian version of the THI and found that there was a relationship between the total score of THI and the functional, emotional, and catastrophic tinnitus. Zapp  has reported the effectiveness of gabapentin in a patient who was tinnitus-free for 23 days in a month and experienced a 75% decrease in symptoms during the remaining days. On follow-up after 2 years, he remained free of symptoms on 500 mg/day of gabapentin. Shulman  used gabapentin in combination with klonopin for its purported GABAergic inhibitory effect and showed similar results. Piccirillo et al.,  in a double-blinded, randomized control trial compared the effectiveness of gabapentin in the treatment of tinnitus for a period of 8 weeks in comparison to placebo and found that gabapentin was no more effective than placebo. Paired t-test analysis of results of this study also revealed no significant difference between pre- and post management scores. Henry et al.,  have stated that the goal of TRT is to induce habituation to the tinnitus, using two strategies which include removal of any negative thoughts or fears that may be associated with the tinnitus perception through counselling and removal of tinnitus from conscious perception by means of sound therapy. Another study has compared the effectiveness of various environmental sounds of nature, water, and air and found that all of the sounds provided a significant reduction in tinnitus annoyance. However, the sounds of nature and water were judged significantly more effective than the other sounds. Jastreboff and Jastreboff  have shown that tinnitus improvement is usually observed by the third month following initiation of treatment, with majority of patients achieving a high level of tinnitus control after 12 months of treatment. Berry et al.,  in their study showed a significant improvement in self-perceived disability following TRT as measured by the THI. Baseline analysis revealed significant correlation between subjective presence of hyperacusis and higher total, emotional, and catastrophic THI scores. Following 6 months of TRT, the total, emotional, functional, and catastrophic THI scores showed significant improvement. Loudness discomfort levels also significantly improved (P = 0.02). These results are similar to our study which showed a significant improvement in tinnitus as measure by THI (P = 0.01) although our study was carried out for a period of 6 weeks. The limitation of our study was the duration of treatment, as treatment was carried out for a period of 6 weeks and long-term follow-up was not achieved. 1. Gleeson M, Browning GG, Burton MJ, Clarke R, Hibbert J, Jones NS, et al. Scott-Brown′s Otorhinolarnygology, Head and Neck Surgery. 7 th ed., Vol. 3. Great Britain: Hodder Arnold; 2008. p. 3595. 2. Pan T, Tyler SR, Ji H, Coehlo C, Gehringer KA, Gogel AS. The relationship between tinnitus pitch and the audiogram. Int J Audiol 2009;48:277-94. 3. Searchfield GD, Jerram C, Wise K. The impact of hearing loss on tinnitus severity. Aust N Z J Audiol 2007;29:67-76. 4. Steinmetz LG, Zeigelboim BS, Lacerda AB, Morata TC, Marques JM. The characteristics of tinnitus in workers exposed to noise. Braz J Otorhinolaryngol 2009;75:7-14. 5. Enrico P, Sirca D, Mereu M. Antioxidants, minerals, vitamins, and herbal remedies in tinnitus therapy. Prog Brain Res 2007;166:323-30. 6. Ernst E and Stevison C. Gingko biloba for tinnitus: A review. Clin Otolaryngol Allied Sci 1999;24:164-7. 7. Drew S, Daveis E. Effectiveness of Gingko biloba in treating tinnitus: Double blind, placebo controlled trial. BMJ 2001;322:73. 8. Zapp JJ. Gabapentin for the treatment of tinnitus: A case report. Ear Nose Throat J 2001;80:114-6. 9. Shulman A. Gabapentin and tinnitus relief. Int Tinnitus J 2008;14:1-5. 10. Piccirillo JF, Finnell J, Vlahiotis A, Chole RA, Spitznagel E Jr. Relief of Idiopathic subjective tinnitus: Is gabapentin effective? Arch Otolaryngol Head Neck Surg 2007;133:390-7. 11. Henry JA, Jastreboff MM, Jastreboff PJ, Schechter MA, Fausti SA. Assessment of patients for treatment with tinnitus retraining therapy. J Am Acad Audiol 2002;13:523-44. 12. Henry JA, Rheinsburg B, Zaugg T. Comparison of custom sounds for achieving tinnitus relief. J Am Acad Audiol 2004;15:585-98. 13. Jastreboff PJ, Jastreboff MM. Tinnitus retraining therapy (TRT) as a method for treatment of tinnitus and hyperacusis patients. J Am Acad Audiol 2000;11:162-77. 14. Berry JA, Gold SL, Frederick EA, Gray WC, Staecker H. Patient-based outcomes in patients with primary tinnitus undergoing tinnitus retraining therapy. Arch Otolaryngol Head Neck Surg 2002;128:1153-7.